The CRKT Avant another exciting collaboration between CRKT and custom knife maker, Eric Ochs. It features a smooth, polished drop point blade with a rounded spine for that custom touch. The bronze pivot, thumb disk, back spacer, and pocket clip add a nice contrast to the black carbon fiber handle. Running on the IKBS pivot system, this knife flips open like a dream. Satin finished 8Cr14MoV stainless steel that is easy to maintain and is corrosion resistant. 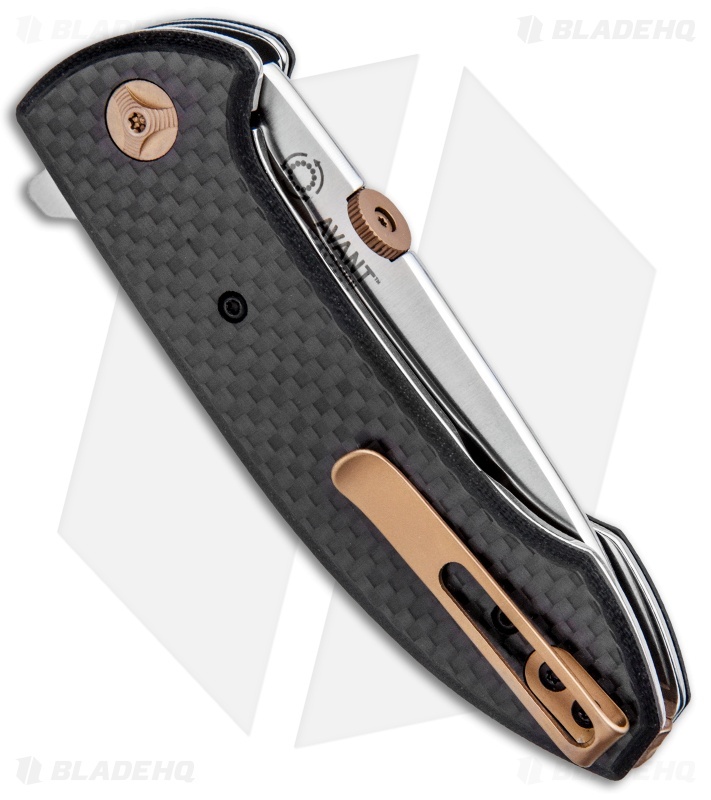 Carbon fiber handle scales with bronze hardware make for an attractive and lightweight knife. 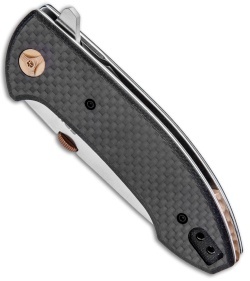 Reversible deep carry pocket clip for tip-up, left or right hand carry. Just wish it was in S30V or D2. Its such a nice nice. Its worthy of a better steel! Buttery smooth action with the ikbs system. The knife is finished beautifully and I thoroughly enjoy playing with this thing. You can tell quite a bit of thought was put into every surface you touch, no sharp edges or hot-spots to speak of. I would have loved to see a bronze insert to cover the notch on the opposite of the clip, just to keep it looking polished all over. My only real complaint is the lock is less than optimal to disengage, but I understand that this was probably a form over function decision. It would be easier to use with a cutout for the liner lock, but it wouldn't look as clean. 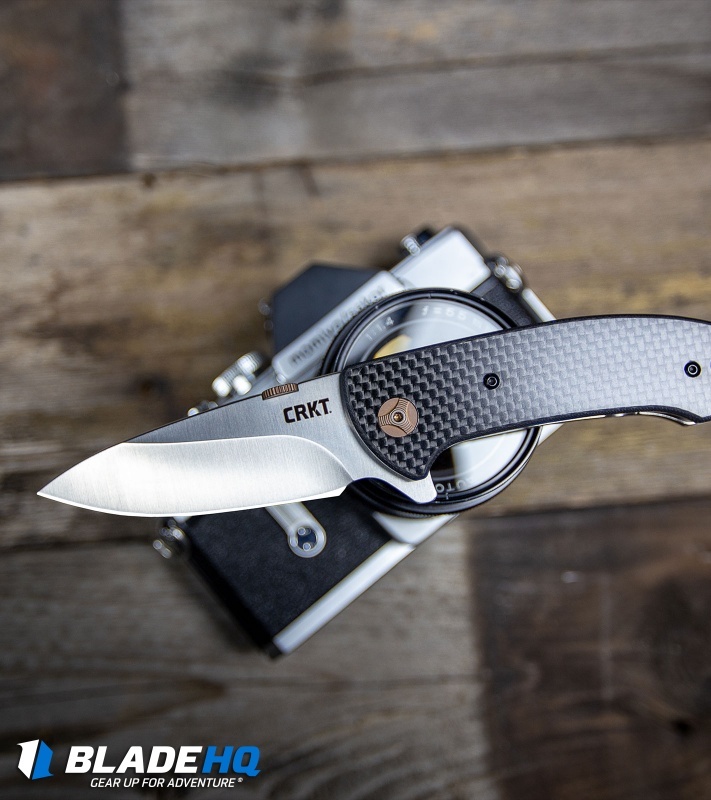 It seems that CRKT is stepping things up a bit with this knife. 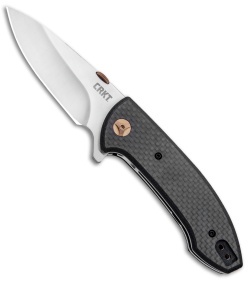 It has features that I have never seen on any other CRKT blade. Great feel in the hand although as one reviewer stated it is a little slick because of the high polish scales...but that's no big deal for me at least. It is quite heavy but some people like that. I don't find it a problem but I always know the knife is in my pocket. It does open and close really smooth and the blade centering is dead center. Great knife overall. If CRKT would have done two things differently, this knife would be awesome. First, it's a total pain in the a** to disengage the liner lock. You can't tell me that when this was designed, someone said "Oh, this is fine". You either have to forcefully jam the meat of your thumb into the gap between the liners or flip the knife over and use your index finger/nail. Second, get rid of the thumb disk and make it strictly a flipper. It's basically just in the way and ruins the look of the blade. Why would you crown the blade nice and smooth and then stick a thumb disk in the middle of it? (Why would you put a thumb disk on a flipper knife at all, for that matter?) Otherwise, I like the knife. It opens very smoothly, locks up tight and looks great. Still giving it 4 stars. The carbon fiber looks good with the bronze colored accents. Clip works just fine, unobtrusive. The detent is dialed in pretty nicely and the flipper tab works well. Opening is smooth. Overall fit & finish is pretty good. 2 things, the liners are not skeletonized or milled out, the front/presentation side liner is a solid slab of steel, putting the weight well over 5oz. Second, the high polish on the liners and the smoothness of carbon fiber make it a bit slippery. I’d like some texture or jimping on the lock bar relief to keep the thumb in place during unlocking, would also like to see some spine jimping for better control. Flips great, crowned blade spine & overall execution make it look really good. Mine came razor sharp even though the factory edge appears a bit uneven. Overall it’s a nice, functional blade, although on the heavy side. No functional or mechanical issues, the lockup is solid and a bit early, implying it’ll likely break in very nicely with use. Despite the classier look and budget price, I think it’d tackle heavier chores just fine. If CRKT released a blacked out version, I’d probably buy it as well.